Posted on Sunday, December 15th, 2013 at 10:00 am. 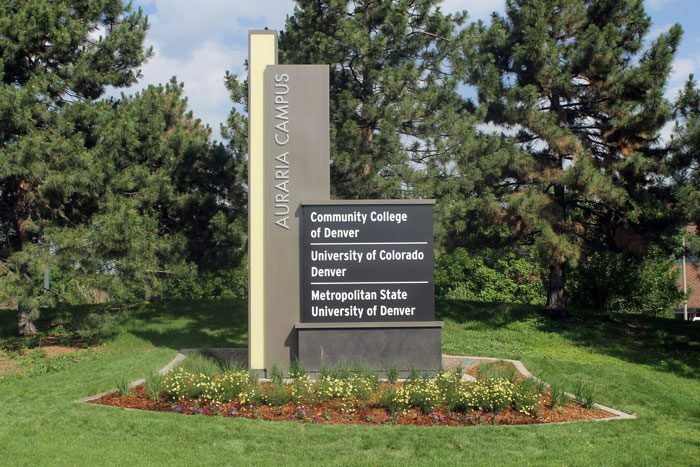 DaVinci Sign Systems of Windsor, Colo., designed and installed four new identification signs on Denver’s Auraria Campus. The signs replace 30-year-old signage with state-of-the-art, energy efficient LED lighting and modern displays to reflect the urban style of the campus and provide identification for the three institutions that share the campus: Community College of Denver, University of Colorado Denver, and Metropolitan State University of Denver. The displays were custom manufactured using steel, aluminum, and 3form -durable, translucent acrylic materials made from 40% recycled content. The results are high visibility monument signs with a low energy cost and consumption. The complete project included sign design and engineering, sign installation, and complementing landscaping with native plants and supporting irrigation. DaVinci Sign Systems specialized in custom fabricated outdoor signs, including monument, electric, architectural, masonry, LED message centers, and other signage for businesses and organizations across the country. Learn more at www.DaVinciSign.com. Website supported by Greystone Web Services.